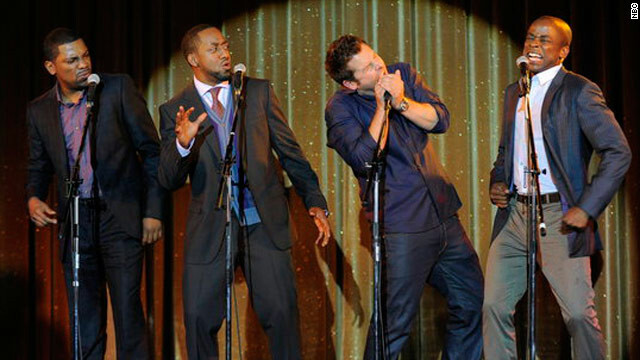 Mekhi Phifer, Jaleel White and Cheech Marin will guest star on "Psych" this week as part of Gus' old a cappella group, who team up with Gus and Shawn to investigate the shooting of an at-risk youth program leader. We certainly can't wait to see White and Phifer break it down with their moves and belt out some classics with Shawn and Gus. Catch this rollicking episode Wednesday at 10 p.m. ET on USA. "Dancing With the Stars" is back! Season 14 will include competitors like Melissa Gilbert, Jack Wagner, Gavin DeGraw and Jaleel White. Catch the season premiere at 8 p.m. ET on ABC. First Lady Michelle Obama will appear on the "Late Show with David Letterman" with a performance by Esperanza Spalding at 11:35 p.m. ET on CBS. Catch the season 1 finale of "The River" at 9 p.m. ET on ABC, where the Magus goes into chaos when a crew member dies. Books coming out this week are: "Stay Close" by Harlan Coben, "The Might Have Been" by Joe Schuster, "Force of Nature" by C.J. Box and "Imagine: How Creativity Works" by Jonah Lehrer. Movies coming out on Blu-ray and DVD this week: "The Girl with the Dragon Tattoo," "The Muppets," "Tinker Tailor Soldier Spy" and "Hop." Music albums being released this week are: "Port of Morrow" by The Shins, "The Hunger Games: Songs from District 12 and Beyond" by Various Artists, "Radio Music Society" by Esperanza Spalding and "The MF Life" by Melanie Fiona. Catch the series premiere of "Bent," a comedy where a newly divorced lawyer and single mother hires a womanizing contractor, who is bent on winning her affection. Watch the hour-long premiere at 9 p.m. ET on NBC. Watch the one-hour special episode of "30 Rock" starting at 8:30 p.m. ET on NBC, where Jack tries to rescue Avery by putting her back in the news. Weird Al Yankovich guest stars. Henry Winkler and Sharon Osbourne will guest star on "Up All Night" as Ava's father and rival respectively. Watch it at 9:30 p.m. ET on NBC. Helen Hunt traces her ancestry and finds out information on her great-great-grandmother's involvement in women's rights on the latest episode of "Who Do You Think You Are?" at 8 p.m. ET on NBC. The much-awaited "The Hunger Games" will hit theaters on Friday. Other movies to check out are "The Deep Blue Sea" with Rachel Weisz and Tom Hiddleston and "October Baby." Is anyone besides me excited about DWTS? Have a good week everyone! Gooorning everyone. Happy Monday. Only 4 more days until Friday time! We hope ya' have a happy and peaceful week . I think everyone dies there. Dead ppls souls can't leave unles they are replaced by another. They are all going to die. But then again, I don't watch gay shows. Sure you don't. I'm sure you don't watch liberal shows either. Can't believe it's the season end of The River. Just when I think I have that show figured out, something happens and then I don't know anymore. If you watch it, what's your thoughts on this show?